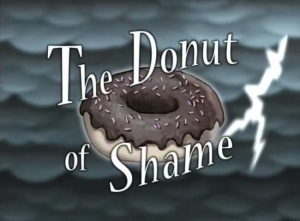 The Donut of Shame (Episode) – From SpongePedia, the biggest SpongeBob-wiki in the world! Patrick wakes up to find himself on SpongeBob's kitchen ceiling. He remembers that he was having a sleepover with SpongeBob. When he sees a donut in SpongeBob's hand, he takes it. But he felt wrong to eat it when he got back home. So when SpongeBob was on his way to watch the video tape of the sleepover. The sleepover was for Patrick's Birthday. Then Patrick tries to hide it. So when SpongeBob came over, Patrick confesses that he took the doughnut because he is really guilty. But SpongeBob shows Patrick the video to show him that SpongeBob gave him the donut last night. So Patrick splits the donut and gives the other piece to SpongeBob. On the part where SpongeBob and Patrick were having a tea party Beary and Ms. Nibsy from episode: Skill Crane was there. SpongeBob: Hey "Star" it's "SquarePants". On the part where Patrick gets a good plate for the donut the music that was playing was similar to the music on Rule of Dumb where Patrick tries to get everything he wants. This is one of the ten episodes in which the title card has an animation. The others are SB-129, Pre-Hibernation Week, One Krab's Trash, Idiot Box, SpongeBob Meets the Strangler, Skill Crane, Karate Island, All that Glitters, and The Krabby Kronicle. When Patrick takes the chain out of his mouth and is about to cough up the doughnut, the chains are seen on the plate, but when the doughnut comes out the chains disappear. This is the second time SpongeBob and Patrick are seen acting loopy from staying up all night. The first was The SpongeBob SquarePants Movie. Patrick thought that when he put the donut under the rug, SpongeBob would step on it, and jelly would come out. But when they eat the donut, there is no jelly. However, it was Patrick's imagination, so it did not have to be true. The date must be February 27, since SpongeBob said it was Patrick's birthday the day before. Patrick's rock does not have a attic. This is one of the two episodes where Patrick is the only main character. The first was Rise and Shine. The Angel and Devil Dounts are voiced by Tom Kenny. How can all of Patrick's plates just jump out of his cabinet? When SpongeBob is going to Patrick's house Squidward four wooden steps that lead to his are not seen. SpongeBob should've got to Patrick's house before Patrick tried to hide the donut. Everytime Patrick finds a new hiding place, SpongeBob gets sent back somehow. This page was last modified on 26 May 2011, at 14:13. This page has been accessed 30,969 times.